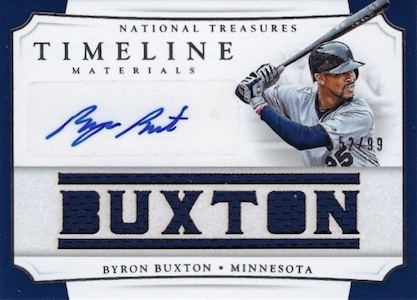 2017 Panini National Treasures Baseball continues the premium hobby tradition, offering only autographs and memorabilia cards. Each box promises eight hits with at least one booklet card. Although the number of hits per box remains the same as the 2016 release, the overall size is scaled back, giving each set more rarity while maintaining the classic NT design. There is also the “1st Off the Line” option from Panini’s online store that provides the product at least one day before the official release, and includes an exclusive Royal Purple base relic. 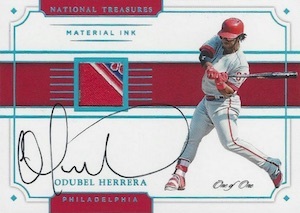 As far as the signed options in the 2017 Panini National Treasures Baseball checklist, Material Ink offers on-card autographs from veterans and retired stars. 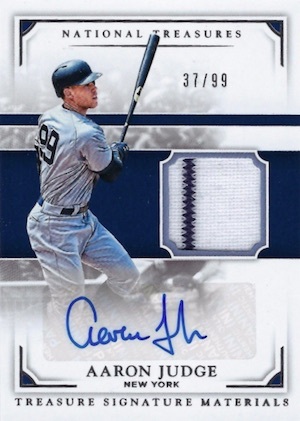 The familiar Rookie Material Signatures set returns with notable talent such as Aaron Judge, while Rookie Signature Jumbo Material Booklet cards debut hard-signed editions paired with over-sized memorabilia. Keeping with the rookie theme, College Rookie Material Signature cards combine autographs and jumbo relics while featuring stars in their alma mater uniform. On the other hand, personalized die-cut relics highlight the Rookie Jersey Signature Vertical set. Celebrating the Chicago Cubs' historical win, the World Champions Tribute Signatures insert includes signed cards by the man behind it all, Theo Epstein. 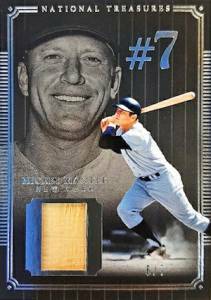 Beginning with "The Mick," the Mickey Mantle Tribute insert in 2017 National Treasures honors the career of the New York Yankees legend with a seven-card memorabilia set featuring top accomplishments, key moments, and memorable nicknames. 2017 Panini National Treasures Baseball also highlights premium items with Bat Barrel, Dual Material, and Jumbo Material relic cards. Lastly, 2017 NT includes a rare one-of-one Dual Cut Signature Booklet insert with pairings such as the Yankees' all-time greats Babe Ruth and Lou Gehrig. PARALLEL CARDS: Gold #/25 or less, Royal Purple #/10 or less (1st Off Line), Holo Gold #/10 or less, Holo Silver #/5 or less, Platinum 1/1. PARALLEL CARDS: Gold #/25 or less, Holo Gold #/10 or less, Holo Silver #/5 or less, Platinum 1/1. PARALLEL CARDS: Gold #/49 or less, Holo Gold #/25 or less, Holo Silver #/10 or less, Brand Logo 1/1, Laundry Tag 1/1, Platinum 1/1, Printing Plates 1/1. PARALLEL CARDS: Gold #/49 or less, Holo Gold #/25 or less, Holo Silver #/10 (Happ, Judge - #/5*), Brand Logo 1/1, Laundry Tag 1/1 (No Happ*), Platinum 1/1, Printing Plates 1/1. PARALLEL CARDS: Gold #/15 (Tyler Glasnow - #/5*), Holo Gold #/10 (Tyler Glasnow - #/5*), Holo Silver #/5, Brand Logo 1/1, Laundry Tag 1/1, Platinum 1/1, Printing Plates 1/1. PARALLEL CARDS: Holo Gold #/25 or less, Holo Silver #/10 or less (No Eckersley, Ripken*), Platinum 1/1. PARALLEL CARDS: Holo Gold #/25 or less (No Cobb, Wagner*), Holo Silver #/10 or less, Platinum 1/1 (Cobb - #/3). PARALLEL CARDS: Holo Gold #/25 or less (No Lajoie/Crawford*), Holo Silver #/10 or less, Platinum 1/1. PARALLEL CARDS: Holo Gold #/10 (No card #2*), Holo Silver #/5 (Card #2 - #/3), Platinum 1/1. PARALLEL CARDS: Holo Gold #/10 (Card #2 - #/5*), Holo Silver #/5 (Card #2 - #/3*), Platinum 1/1. PARALLEL CARDS: Holo Gold #/10 (Mantle - #/7*), Platinum 1/1. PARALLEL CARDS: Holo Gold #/10 (Card #1 - #/2; No card #3), Platinum 1/1. PARALLEL CARDS: Holo Gold #/10 (Card #1 - 1/1, #5 - #/2; No card #4*), Platinum 1/1. PARALLEL CARDS: Holo Gold #/5 (Card #2 - #/3*), Platinum 1/1. PARALLEL CARDS: Holo Gold #/10 (Card #2 - #/5*), Platinum 1/1. PARALLEL CARDS: Holo Gold #/10 (No Heyward; Soler - #/5*), Platinum 1/1. 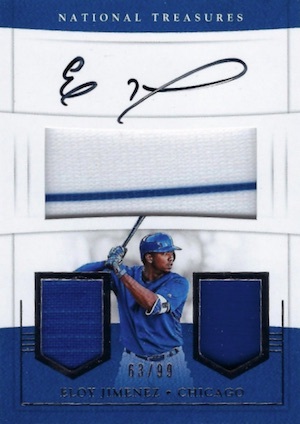 PARALLEL CARDS: Jersey Number #/10 or less, Nameplate #/10 or less, Team Logo #/10 or less, Patch #/5 or less, Brand Logo 1/1, Brand Tag 1/1, Laundry Tags 1/1. PARALLEL CARDS: Bat Signatures Gold #/25 or less, Jersey Number Holo Gold #/25 or less, Nameplate Holo Silver #/10 or less, Team Logo Black #/5 or less, Brand Logo Green 1/1, Brand Tag Purple 1/1, Laundry Tags Red 1/1, Patch Signatures Platinum 1/1. PARALLEL CARDS: Prime #/15 or less (No Harper*). PARALLEL CARDS: Holo Gold #/25 or less, Holo Silver #/10 or less, Platinum 1/1. PARALLEL CARDS: Holo Gold #/25 or less (No card #2*), Holo Silver #/10 or less, Platinum 1/1. PARALLEL CARDS: Holo Gold #/10 or less, Holo Silver #/5 or less (No card #3*), Platinum 1/1. PARALLEL CARDS: Holo Gold #/10 (Card #5 - #/5*), Holo Silver #/5 (Card #5 - #/3*), Platinum 1/1. PARALLEL CARDS: Holo Gold #/5 (Ruth - #/3*), Platinum 1/1. All subjects not included in Holo Gold parallel. View specific options with the spreadsheet. PARALLEL CARDS: Holo Gold #/5, Platinum 1/1. PARALLEL CARDS: Stats #/99 or less. PARALLEL CARDS: Stats #/25 or less. PARALLEL CARDS: Moments #/99 or less, Nickname #/99 or less, Stats #/99 or less (No Bobby Thomson*). PARALLEL CARDS: Stats #/10 or less. 7 cards. Serial numbered #/7. PARALLEL CARDS: Holo Gold #/10 or less, Platinum 1/1. PARALLEL CARDS: Holo Gold #/10 or less (No Donaldson*), Platinum 1/1. PARALLEL CARDS: Holo Gold #/10 or less, Platinum 1/1 (No Alex Bregman*). PARALLEL CARDS: Prime #/10 or less, Platinum 1/1. All subjects not included in Prime parallel. View specific options with the spreadsheet. PARALLEL CARDS: Gold #/49 or less, Holo Gold #/25 or less, Holo Silver #/10 or less, Black #/5 or less, Platinum 1/1. PARALLEL CARDS: Prime #/15 or 1/1 (Fred Lynn - #/10*). 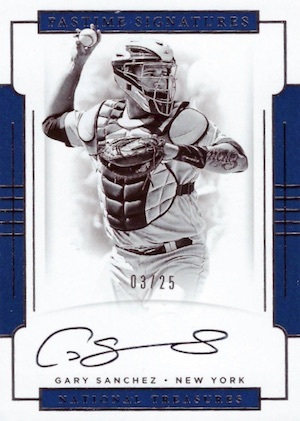 PARALLEL CARDS: Prime #/5 or less (Kluber - #/10*). 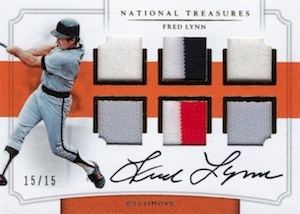 PARALLEL CARDS: Prime #/5 or less (Fred Lynn - #/10*). PARALLEL CARDS: Prime #/10 (Larkin, Zimmer - #/5; Banks, Matsui - 1/1; No Berra*). PARALLEL CARDS: Prime #/10 (Benintendi, Swanson, Bell - #/5*), Platinum 1/1. 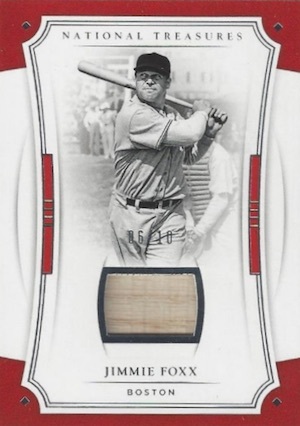 PARALLEL CARDS: Prime #/10 (Swanson - #/5*), Platinum 1/1. PARALLEL CARDS: Platinum 1/1 (No Fergie Jenkins*). 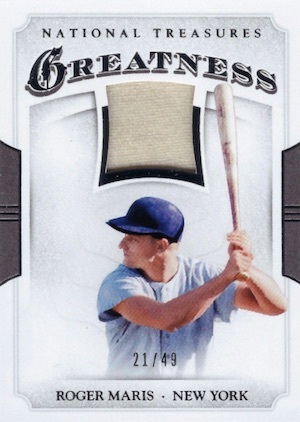 PARALLEL CARDS: Prime #/25 or less, Laundry Tags #/10 or less, Button #/6 or less, Brand Logo #/5 or less. 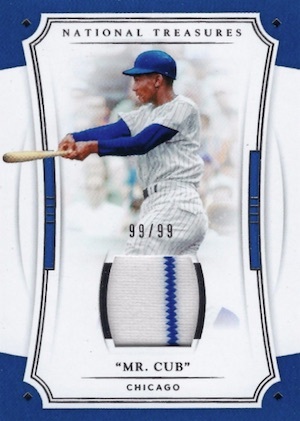 PARALLEL CARDS: Prime #/25 or less, Laundry Tags #/6 or less, Button #/6 or less, Brand Logo #/5 or less. What are the Supplied Cards on the checklist mean? Pretty sure I had a buddy pull a 2016 version card out of the 2017 product. Is that all it is? Supplied is what Panini calls their update cards from earlier releases. 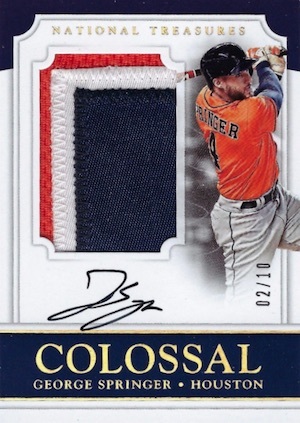 It’s a 2016 card that was released in the 2017 product. Panini does this often in their high-end sets. I would think most consider it a 2016 card but with the disclaimer that it was issued in the 2017 set.